During Apple’s event, the tech giant unveiled its gargantuan sized iPad Pro that not only features a resolution of 2732 by 2048 pixels (resulting in the product having more pixels compared to a 15 inch MacBook Pro), but also a huge screen size of 12.9 inches. Now, the latest hardware specification that we have been able to come across shows that iPad Air 2 is nowhere near in the same performance league as the newly announced slate. During yesterday’s keynote, Apple did reveal a lot of features that were present in iPad Pro. Perhaps the most notable hardware component incorporated into the 12.9 inch tablet was its A9X SoC, which delivers 1.8 times the performance of A8X, the chipset that is present in iPad Air 2 (and is also able to make short work of NVIDIA Tegra K1 with a Denver CPU). Now, Apple did not divulge the amount of RAM that is present in iPad Pro but it looks like it will not have to since Adobe has already spilled the beans. That being said, iPad Pro features 4GB of RAM, which is twice the amount that is present in iPad Air 2. After all, editing three 4K streams in a single time will require sufficient amounts of RAM, and the tablet is armed to the teeth in order to provide a fluid operation to the user. If that was not enough, Apple has also rolled out two accessories, which will have to be purchased separately, unfortunately. Apple Pencil is the company’s first ever stylus and will be retailing for $99, while Smart Keyboard is a keyboard accessory which will provide an additional layer of productivity, if you happen to be sick and tired of using the on-screen keyboard of iPad Pro. According to Apple, the 12.9 inch slate will also be able to deliver 10 hours of battery life, and features an 8MP iSight rear camera. The product also serves as an ideal multimedia device, since it features four stereo speakers that deliver an unprecedented sound quality as compared to the rest of the iPad lineup. 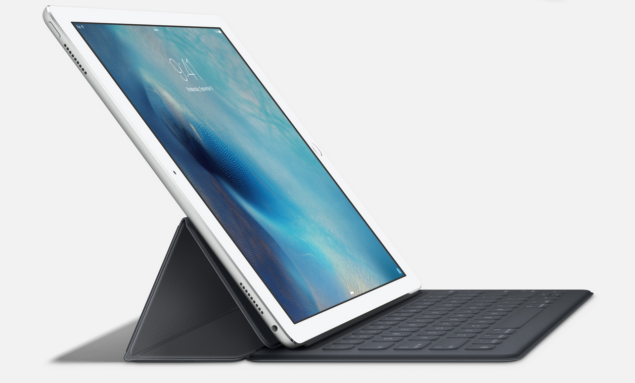 The starting price of iPad Pro is $799 for the 32GB model. The tablet will ship out during the month of November, and will also be available to purchase in the following storage variants (pricing details have also been included). So what do you guys think? How much fight will iPad Pro be able to deliver to the competition? Let us know your thoughts.